Secondly we prepared something extra special for you. 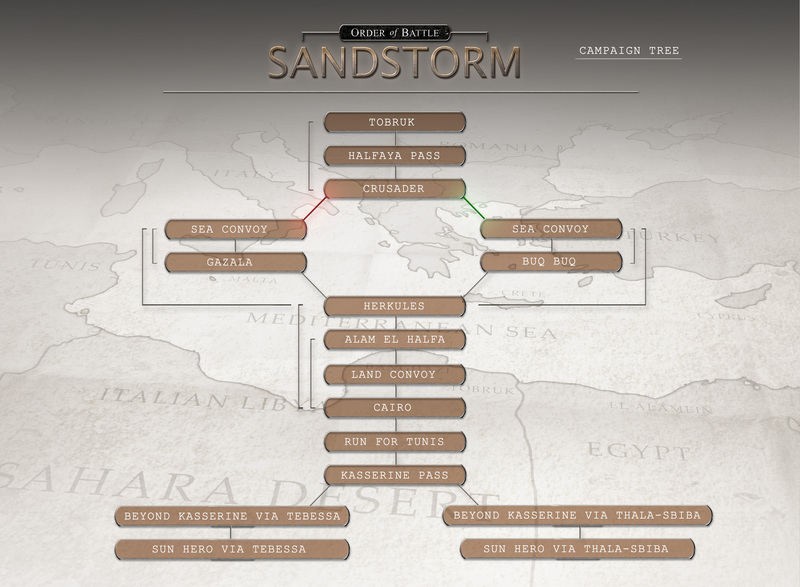 Sandstorm has a branching dynamic campaign tree which means that the outcome of battles or managing to fulfill certain optional objectives will affect the campaign later on. We have drawn an infographics to show you how the system works! The arrows connecting specific scenarios mean that the result in one scenario affects the other. For instance, the Crusader scenario will be different depending on whether or not you managed to capture Tobruk in the first scenario. This will allow for greater replaybility and more variety as your choices and accomplishments will actually matter. Sandstorm is going to be released next week on May 16th, don't miss it! Last but not least, the Order of Battle online tournament is over and a432 is declared champion, having defeated 13obo in the final! Congratulations to him and thanks for everyone who took part! Last edited by zakblood on Thu Aug 09, 2018 2:31 pm, edited 3 times in total. This type of development has been very-long-OverDue!. These steps taken will definitely help take the tediousness & boredom routine OUT of replaying these Games!. Continuing on with the... "MAJOR-WUNDERBARR!!!" Theme!. "the result in one scenario affects the other" : Why-Not this aspect also carry on further with not only "One-Scenario-Affecting-Another", but!...Also "Affecting-Campaign's!". Just for Example!, what-if "MALTA" was acquired by the "AXIS", then the "SUEZ-CANAL" could no-longer funnel in resources in from "Asian-Pacific-Region", the 'Middle-East'...as well as from where-ever-else...to 'Britain' to keep it supplied with Oil, Rubber and so on!. The British would also have a much more difficult time supplying & re-enforcing their troops in 'North-Africa' as well!. This situation, if it became "An-Actuality", would then make if much more feasible for "ROMMEL" to take "CAIRO & the SUEZ-CANAL!". This...then would mean that WWII would not-necessarily have to have the Out-Come that it originally had...Meaning that "YOU" would have "An-Opportunity-To-Change-History!!!". So!,what about 'that' for making Gaming "More-Exciting!!!". Ah, this takes me years back when I discovered numerous fun ways of formatting in Word as well. Good times! Retributarr wrote: Continuing on with the... "MAJOR-WUNDERBARR!!!" Theme!. Retributarr Corporal- Strongpoint_"So!,what about 'that' for making Gaming "More-Exciting!!!"." calmhatchery Sergeant Major - SdKfz _ "I hope that devs will think about (Doing) the same with another campaign DLC like 'Rising SUN' for example..."
Midway Island' also so as to use it as a land-based-AirCraft-Carrier!. Then let's see how this PACIFIC Picture evolves!.